You deserve the perfect personal banker resume. All your customers know they can bank on you. And you know how to make their banking experience truly personal. They don’t need convincing. But do you know who does? And they’ve got more applicants fighting for your banking job than clients. You need a banking resume that will make them understand you’re the best. A personal banker resume better than 9 out of 10 other resumes. How to write a personal banker resume that will land you more interviews. Tips and examples of how to put skills and achievements on a personal banker resume. How to prepare a personal banker job description section on a resume to get any job you want. Here’s a sample personal banker resume made with our online resume builder. Sample Personal Banker Resume - See more templates and create your resume here. What’s the Best Format for a Personal Banker Resume? Your personal banker resume must immediately draw the recruiter’s attention, and make them bet all their chips on you. For starters, lay your personal banker resume out in the reverse-chronological resume format. This way, you’ll bring your experience and achievements to the front, and make them readily scannable. Put white space to good use. Save your personal banker resume as a PDF file. PDF is the adamantine armor for your personal banker resume—it will keep it intact on any operating system, device, or planet. Now, you’re ready to move on to the first section of your resume. 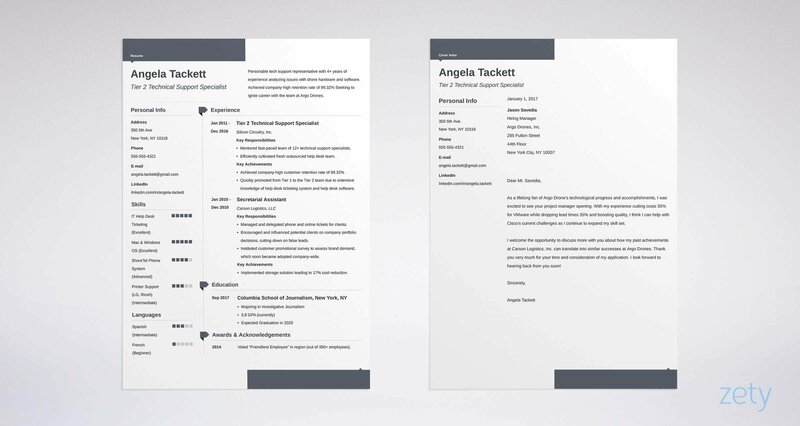 It might be tempting for you to use a functional resume format. In most cases, you should avoid it at all costs. 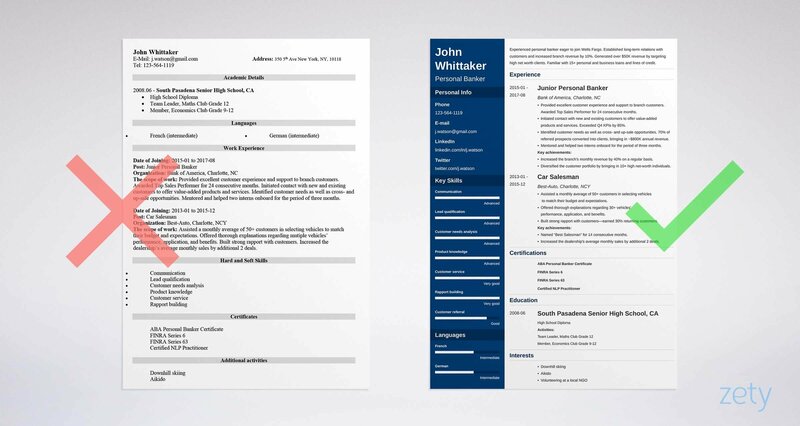 Still not sure about the best format your personal banker resume should stick to? Here’s a quick read: Best Resume Format: Which to Choose? Personal Banker Resume Summary or Resume Objective? And you only have 6 seconds of the hiring manager’s attention. But you want them to put a lot of money on you. You need to prove you’re worth your weight in gold right off the bat. By writing a professional personal banker resume objective or summary. Personal banker resume objective—consists of 2 or 3 sentences showing the recruiter you’re a great fit. It works best for those with limited experience. Personal banker resume summary—you’ve guessed correctly—it summarizes your work experience that matches the position you’re applying for. As such, it’s best suited for those with previous experience in the field. This section of your personal banker resume is the first thing the recruiter will set their eyes on. It’s basically an executive summary which should give them the bottom line: hire this candidate if you want your business to excel! Experienced sales agent eager to join Wells Fargo. Established long-term relations with customers and increased revenue by 10%. Generated over $50K revenue by targeting high net worth clients. Familiar with 15+ personal and business loans and lines of credit. Looks for a position of a personal banker with the company. Solid sales and advisory experience. Great communication skills. Isn’t the resume objective suitable for an entry-level personal banker resume with no experience? After all, The first candidate doesn’t look inexperienced whatsoever. The first candidate may have zero experience as a personal banker. But knows how to put their relevant experience to good use. Guess what? He used his experience as a car salesman to get his mortgage banker resume on track. The second candidate’s resume objective looks bland, offers no specific information and could be put on any resume for any job. Not personal, not worth a dime. Goal-oriented personal banker with 5+ years of experience, eager to take on new professional challenges at Bank of America. Drove the sales of diverse credit lines and personal loans growing branch revenue by 30%. Closed Q3 2018 with KPIs at 175%. Managed assets of 10+ high net worth clients (upwards of $1M.) Ranked Top Sales Performer for 3 years running. Goal-oriented highly experienced personal banker ready to start work within an expanding organization. Knowledgeable about credit lines and personal loans. Skilled in sales and asset management. It focuses on their track record. It’s specific about their experience. It shows their biggest achievement(s). It gives numbers wherever possible. The opening statement of your personal banker resume should offer a taste of things to come. A wishy-washy personal banker resume objective or summary will leave the recruiter totally unimpressed. So make sure yours packs a punch! Still not sure how to go about writing your personal banker resume objective? Have a look at our guide: 20+ Career Objective Examples that Work. The job description section of your personal banker resume is where you close the deal with the recruiter. To become a personal banker—the position you’ve been dreaming of—you really need to prove you’re worth your salt. Here’s how to describe your personal banker duties and responsibilities in a way that will land you an interview. Browse through personal banker jobs online to identify a position that matches your experience and qualifications. In fact, this bullet point list comes from a real job posting. But similar requirements could be found in job ads from HSBC, Chase, Wells Fargo, or Bank of America. The highlighted sections show you the required skills for a retail personal banker. Use the very job ad you’re replying to craft your own personal banker job description. And show the hiring manager it is you they’ve been looking for. Provided excellent customer experience and support to branch customers. Awarded Top Sales Performer for 24 consecutive months. Initiated contact with new and existing customers to offer value-added products and services. Exceeded Q4 KPIs by 85%. Identified customer needs as well as cross- and up-sale opportunities. 70% of referred prospects converted into clients, bringing in ~$800K annual revenue. Mentored and helped two interns onboard for the period of three months. Increased the branch’s monthly revenue by 40% on a regular basis. Diversified the customer portfolio by bringing in 10+ high net-worth individuals. Now that’s a winning job description for a personal banker. And even though there’s no such thing as a universal banker resume, there is a universal formula for you to follow when crafting your personal banker job description. Reply to a specific personal banker job posting. Go for resume action words and highlight your personal banker skills. Focus on your achievements, not responsibilities. Show how well you’re able to perform personal banker duties. Put numbers wherever you can. But you know that already, don’t you. Numbers are a banker’s daily bread. Never underestimate the importance of replying to a specific job offer. In this day and age companies use Applicant Tracking Systems (ATS) to initially screen the resumes for keywords. The ones used in the original job posting. That’s why it’s a really good idea to use the job posting itself as a point of reference. Just make sure you’re using the right resume keywords for your personal banker resume job description section. You’re about to impress the hiring manager with what you can do. Have you ever bought anything, just because you were so impressed by the bullet point list of the thing’s features? Well, you need to know that no hiring manager is going to be impressed with the list of your skills either. Because anyone can come up with a similar looking list. If you’ve done your personal banker description right you’ve already demonstrated all the skills the recruiter is after. And more than that—you’ve shown them how good you are at each of them! The thing is your personal banker skills haven’t been presented as dull bullet points. You showed them in the context of your experience and proved how well you’re able to carry out your personal banker duties. Would it be enough to simply paste this list in the skills section of your banking resume? Remember, follow our advice from the previous section and explain what you can do and how well you can do it. However, key skills extracted from your personal banker job description should also be included in a separate “skills” section. If you’re not sure how to do it, take another good look at the personal banker resume example at the top of the page. Blend them in your resume job description bullet points. If in doubt, go to the personal banker resume sample at the beginning of the guide. You have all the personal banker qualifications required for the position. And the Bureau of Labor Statistics says the demand for financial positions is on the rise. So do the other 299+ other candidates who have applied. You need to leverage any advantage you might have. Including education. Don’t simply plonk the name of the college you graduated from. List coursework relevant to the position. This is what your personal banker resume education section may look like. Some personal banker jobs do not require college-level education, but a minimum of high school diploma or equivalent experience. If that’s the case, do not fail to add any extracurricular activities you’ve taken part in that might be relevant to the position you’re applying for. Don’t forget to mention all your hard earned certifications. In fact, it’s a really good idea to list them all in a separate section of your resume. Especially if you’re writing a licensed personal banker resume. The same is true about all the conferences you’ve attended or been a speaker at. If you’re not sure how to do it right, take another good look at the personal banker resume samples at the top of the page. How About a Personal Banker Cover Letter? If you could put up two billboards to advertise your business at a busy crossroads, would you put up only one and say you don’t really need the other? You’d put up two to double your chances. The same is true about cover letters. Cover letters still matter, and they can double your chances of landing a personal banker job. Plus, they give you a chance to prove your communication skills in practice. Make sure it’s simple and to the point. Fill in all the blank spaces you may have left on your personal banker resume. Keep it organized and write it clearly. Focus on a particular position in a particular bank. Start out with a strong opening statement: personal banker objective or summary. Craft your personal banker experience section by focusing on your achievements, not responsibilities. Lay everything out in a scannable, eye-catching, professional-looking format. Is this your first resume for a personal banker position? Or maybe you’re a seasoned pro eager to help the rookies out? We’d love to hear from you. Give us a shout out in the comments below!